After a vote by the Board of Trustees in October 1975, the college admitted its first women resident students in the fall of 1976. Sometimes that gets shortened, somewhat inaccurately, to a statement that Wofford only began to admit women students in 1976. 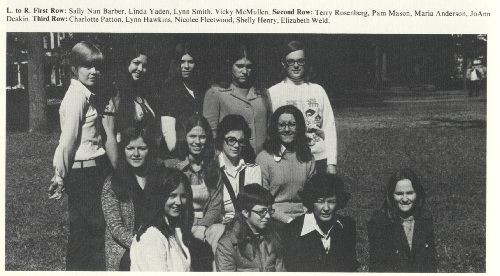 Members of the Association of Wofford Women in 1975. While it’s true that those first resident women students experienced Wofford in a different way, it is not true that they were the first women to attend Wofford. On several occasions before 1976, Wofford had women students. Here are the phases that led to full residential coeducation at Wofford. First, from the spring of 1971 to the spring of 1976, several dozen women attended as day students. Beginning in February 1971 with four women, three of whom were daughters of professors, the numbers increased to about 25 in the fall of 1971. One of those first four women day students graduated in the spring of 1972, and the number of graduates grew each year. But the story of Wofford women doesn’t start in the spring of 1971. Throughout the 1940s, 1950s, and 1960s, women occasionally attended and completed degrees. In particular, a number of women attended summer school and often participated in summer graduation. From records in college catalogues, almost every class from 1947 to 1959 had at least one woman graduate. Beyond that, women were regular enrollees in the college’s graduate programs, which existed from the early 1900s to around 1951. These afternoon and summer courses frequently drew area teachers, and perhaps half of the Master of Arts degrees awarded by the college in this era went to women. The nursing program at Spartanburg General Hospital had women taking certain courses in the 1950s and early 1960s on campus as well. 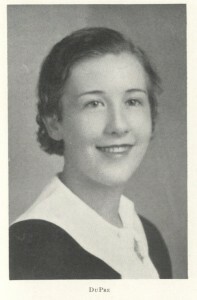 Before that, Dean A. Mason DuPre’s daughter, Caroline DuPre Wells, attended and graduated with the class of 1934. Her attendance was fairly unusual in that era in that she did attend during the regular semester and graduated at a regular, as opposed to a summer commencement. But even earlier than that, Wofford had a short experiment with coeducation between 1897 and 1904. Two women enrolled in each class beginning in September 1897, so by the fall of 1900, eight women were taking courses alongside the 200 or so men. Each of these eight women graduated between 1901 and 1904, though the college ended the experiment after the last of these women graduated. At one point, one of those eight women was actually the college’s oldest living alum. In other words, a college that was supposedly a “men’s college” had an alumna as its oldest living alumnus! So, since 1897, we’ve moved from an initial experiment with coeducation, through a period of irregular and occasional women students, through graduate and summer school coeducation, to day student coeducation, and finally to full residential coeducation.